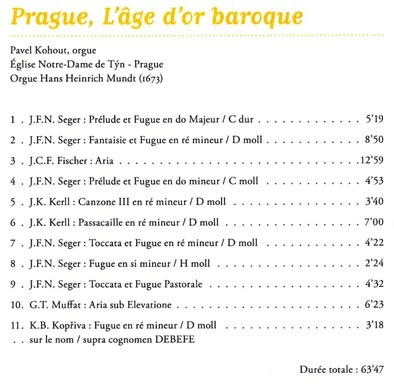 Pavel Kohout, leading Czech and international acclaimed concert organist, winner of both First and J. S. Bach Prize at the International Organ Competition in Tokyo 2000, brings forth from Prague’s historic Mundt organ (1673) a superb anthology of pieces by bohemian composers, such as Josef Seger, one of the organ’s first titulars, all of which were played in Prague, one of the principal centres of cultural exchange in baroque Europe.The Mundt’s organ is considered to be the most important historical organ of this kind in Bohemia. It is unique not only from the point of view of its exceptionally high value and refined sound but also as an object of art, but due to the fact that it has survived almost in its original state. 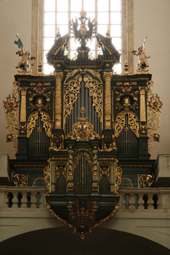 Only several 17th century European instruments show such a high degree of originality. Kohouts hoch löbliches Engagement lässt Einblicke in eine Komponistenwerkstatt zu, die Josef Ferdinand Norbert Seger stillistisch als Nacheinferer Johann Sebastian Bachs zeigen.